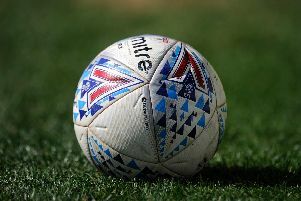 He has seen many a battle in League One, and Fleetwood Town skipper Craig Morgan is not surprised that tomorrow’s opponents Shrewsbury have gone from promotion contenders to the bottom half of the table this season. The Shrews were last term’s surprise package, challenging Blackburn and Wigan for the automatic promotion under Paul Hurst. That form saw Hurst snapped up by Championship club Ipswich, with John Askey taking the Shrews’ reins . Morgan, 33, was part of a Rotherham side that beat Leyton Orient 2-1 at Wembley to clinch promotion from the third tier in 2013-14. Orient were relegated the following season. Nothing surprises the Welsham, who said of Shrewsbury: “Not being disrespectful to them but that happens in this league. “I remember Leyton Orient – it happens. You can assemble a squad and play in a certain way, and that team can overachieve. After a four-week lay-off with a hamstring injury, Morgan has played 45 minutes in Town’s last two matches and hopes to start against the Shrews. He said: “It is going to be a difficult game. They have picked up lately. They have got players who were there last year and got in the play-offs. They are not bad players or a bad team. “They might have had a bit of an unfortunate start and it was not what they were expecting. Posh and Pompey occupy the top two places but Morgan hopes Town can mount a challenge themselves. He said: “We have not fulfilled our potential yet. We need to keep doing what we are doing and there is no reason why we cannot get into the play-offs. “Everyone can beat everyone. Barnsley won 4-0 at Peterborough; Gillingham go to Portsmouth and win – it just happens. “Every week in this league there will be a surprise and you can easily go on a run. “Barnsley do look strong and have a good squad as do Portsmouth. You’d expect them to be there or thereabouts. “There will be a few teams in that top six and 10 that I would have thought would be in the play-offs.